These lectures were delivered over several days at the Department of Philosophy, Wuhan University, under the invitation of Professors He Ping and Wang Xinyan. The videos show excerpts from the lectures and discussions by faculty and students in response. The first lecture is a general discussion of dialectics. Lecture two covers themes from my Marx at the Margins (2010). Lectures three and four deal with issues from my Lenin, Hegel, and Western Marxism (1995). The audience – which was both outspoken and knowledgeable — consisted mainly of Wuhan philosophy faculty and grad students. Many of the latter were working on dissertations on Western Marxists and radical thinkers, such as Herbert Marcuse, Antonio Gramsci, Marxism and feminism, Rosa Luxemburg, Jürgen Habermas, Karel Kosík, Louis Althusser, Michel Foucault, Georg Lukács, Jean Baudrillard, or Raya Dunayevskaya. 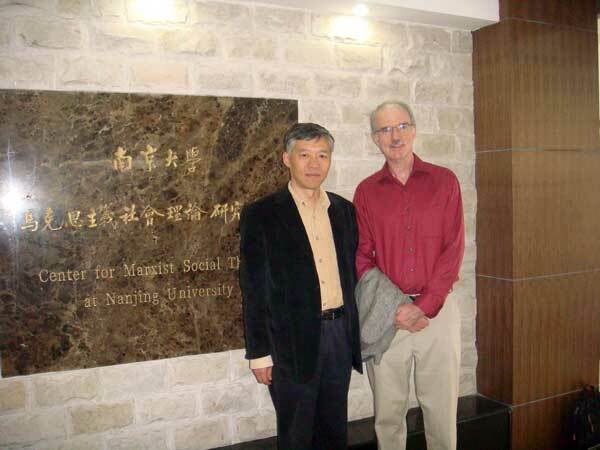 Professor Zhang Yibing, a philosopher at Nanjing University, with Kevin Anderson. Anderson also spoke at a conference on “Contemporary European Thought and Culture” at that university in October 2007, which featured three other international visitors: Douglas Kellner, Stephen Eric Bronner, and Alexander Callinicos.